This year Sarah's class carved a pumpkin at school so she was excited to get home and carve one herself. You see, at school they took a vote on what kind of face to put on the pumpkin. Out of 20 students, Sarah was the only one who wanted to make the pumpkin happy. Everyone else wanted to make him spooky and scary. She must have talked about this for 15 min. straight when she got home from school yesterday so obviously it bothered her that no one wanted a happy pumpkin! 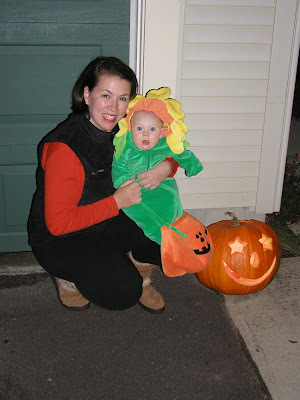 I told her that I was a fan of happy pumpkins too and showed her an old photo of our first happy pumpkin. This year she wasn't into the gooey part but once we got it carved and lit, she was very happy. Unfortunately, Ansley missed all the action because she was sleeping but she was able to participate in seeing our little pumpkin all lit up. I think she was the most excited out of everyone because all she did was squeal and point at our little pumpkin friend. This was definiely a fun year for pumpkin carving! After viewing the blog and seeing video of herself and Ansley, Sarah decided she wanted to contribute something on her own. Here she is singing Humphrey the Blue Nosed Pumpkin. Hit it Sarah! And in true diva fashion, after seeing herself sing, she decided that she HAD to count to 100. ...and of course have it filmed!! Today Adam left for a business trip and since the girls were missing him, I told them they could both sleep with me tonight. Sarah was being so silly and Ansley couldn't stop laughing. Fortunately I had my phone with me and was able to record a little bit of it. I think the two of them could literally entertain themselves for hours! This time of year begins the start of cooler weather, holidays and lots of fun family activities. One of our favorite songs on Noggin is the Candy Corn song. It is only played during the month of October so whenever we hear this song we love to all chime in and sing along (even though we all LOVE candy corn!!) Warning, this song can get stuck in your brain. We've been singing it constantly all month long!! I seem to be stuck in 1984 for my flashback videos but the Ghostbusters theme is a must for this week. Ghostbusters was the biggest grossing movie of 1984. Who ya gonna call?? GHOSTBUSTERS!! 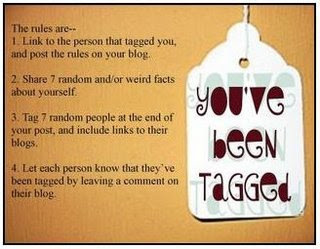 I've been tagged so I must answer. Here we go...random,weird, and wacky facts about Moi that you may not know. 1. I met John McCain at a book signing in Atlanta back in 2000. He was very nice and took a picture with me. Unfortunately I don't have it to post since it's packed up in storage with the rest of my life! 2. I have no wisdom teeth....and never had any to begin with. In college a friend of mine had her's taken out and she got what she called dry sockets?? I remember hearing how awful the pain was and I was petrified of having mine removed. When I went to my dentist, he showed me my x-rays and there were none to be found anywhere. I was so excited....YAY!! 3. I don't like the taste of coffee. I know that's really rare to find someone who can't drink a normal cup of coffee but I can't. To me the taste of coffee is horrible and actually none of my siblings drink coffee either (I'm one of 5.) I don't know what to attribute this dislike to other than the fact that my mom drank the stuff 24/7 when we were growing up and we never liked the smell of coffee breath (sorry mom..you know I love you though!) Now, let me say what I CAN drink. I CAN drink a Starbucks with 9 parts milk, syrup, and yummy stuff and 1 part coffee. Because of this, Starbucks gets a lot of business from me even though I could really care less for the actual stuff they are famous for!! 5. I am related to a former president of the United States. He wasn't a very good one so I normally don't announce this but had to come up with something to write that few people know about me. Oh, he was #15 James Buchanan. 7. I've visited a Body Farm in Knoxville, TN. Yes, I said BODY FARM...as in a place where they study dead bodies. I was a criminal justice major to begin with in college and our Forensics professor took us on a field trip to this place where they study decomposition of bodies. They were all unclaimed bodies from the morgue and they would study how different fibers and things decomposed under certain conditions (left outside, hidden under leaves, exposed to animals, left in cars, etc.) Our professor actually called us over to the back of a car and had a wild laugh (and shared the video with many classes after that) when he popped open the trunk to reveal what looked to us like the Michelin Man and smelled even worse. 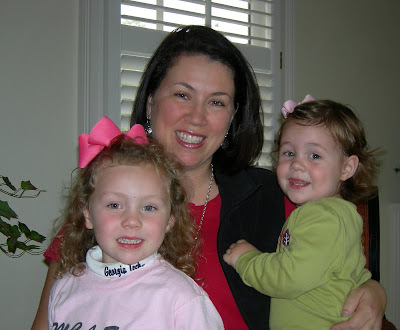 Fortunately my best friend Wendy was along for the ride so we share this same weird memory. It was horrible and gross and the smell was ungodly but I WILL NEVER FORGET IT as long as I live!! There you have it! In all fairness to the game, I don't really know 7 other people that have blogs (other than the people who tagged me) so I will email this out instead! Last night Ansley slept in a big girl bed. This is really huge for me because she actually let me know that she wanted to go to bed. 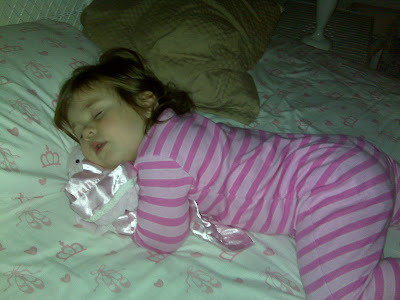 Sarah never willingly wanted to go to sleep, much less crawl up in the bed and go to sleep on her own. Ansley walked over to the bed with Bun-Bun in tow, stretched her arms upwards and said "nigh-nigh." I picked her up, put her in the bed, turned on her music and within 10 minutes she was sound asleep. I was so excited! Hopefully this is the start of her doing this more often. God Bless and sweet dreams little Ansley. Recently Sarah has had a strong desire to help out in the kitchen. I can only attribute this desire to her new game Cooking Mama:Cook off that daddy got for her to play on the wii. Normally the only games we let her play are tennis and bowling but I have to admit that she and I have had a lot of fun playing Cooking Mama together and cooking up all the different recipes. When she sees me cooking dinner she is always wanting to cut, chop, dice, stir, measure, or swirl the pan like cooking mama. The other night we made baked terriyaki salmon (she poured the glaze), brown rice (she punched the buttons on the microwave), green beans(she washed and put them in the pot) , and Scooby Doo macaroni and cheese (she pretty much did it all on this one.) Upon hearing of Sarah's new love of cooking, our friend Ms. Nancy from Florida surprised us and made Sarah two little aprons to wear in the kitchen. While Ms. Nancy was visiting us last night, she and Sarah made a batch of delicious brownies for fdessert and Sarah wore her new apron. Now our little Cooking Mama is official! Rachel Ray...watch out!! As I'm sure you all know I'm a HUGE 80's fan. The girls and Adam usually don't have a choice when we are riding in the car together because my radio is always tuned into XM channel 8 (80's on 8.) The music was great, the styles were great, everything was great, great, great (in my eyes.) Growing up, I related so much to music and each time I hear a great 80's song it always takes me back to memories of my youth. When this song was popular I was 13 years old and thought I was so cool, especially when I would hear this tune. Here is my Friday blast from the past...1984 - Corey Harts Sunglasses at Night video. Enjoy because you know you have all said this motto at least once!! Ok, I really should have posted this with the last post but I forgot I had it on this computer. All of my pictures are on the desktop which sadly has been packed up for....7 months now. It kills me because I can't get to any pictures of the girls. As I was longing for a picture of what they looked like last year, I remembered I had this one on facebook. It is hard to believe this was taken just last year. Maybe it's not such a bad thing to have all those pictures packed away because seeing this one makes me want to put things on pause for a little while so they don't grow up so fast. 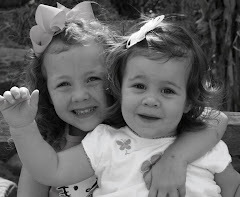 Thank you sweet Lord for my two precious babies!! 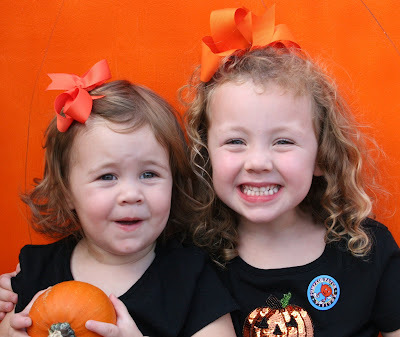 As I mentioned in a previous post, I'm sure we will be visiting lots of pumpkin patches this year. Everytime we drive by one Sarah will make sure and let me know as we pass it. This year the church where Sarah goes to school has a pumpkin patch so yesterday after school we stopped by to pick something out. Knowing this won't be the last pumpkin patch visit we make, I took Sarah over to the table and showed her what size we needed to get and she went on her way in search of the $4 size pumpkin. 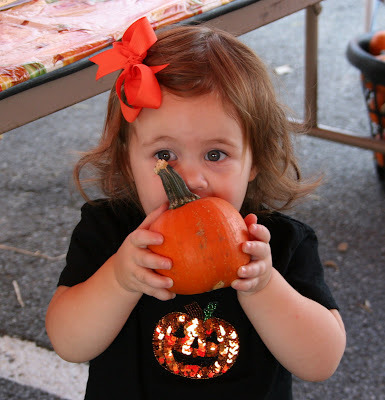 Ansley had already made her way over to the table with baby pumpkins and had found the perfect one for herself so she proudly carried it around while Sarah searched for one of her own. A minute or two later Sarah proudly announced she didn't want a pumpkin because she had found something she wanted more.... a beautiful squash. :-) As we were leaving, I couldn't help but smile because both girls were so excited with their finds. And the best part.....we only spent $1. Recently Ansley has been talking more and trying to communicate the best she knows how. Usually it's a huh, or a blah or some sort of sound she makes that only she can understand. The other day she was sitting at the table eating her snack and she pooted. Instantly she looked up at me with this huge grin and said Poo-Poo! In a few minutes I noticed that indeed her diaper was full as she kept saying poo-poo, poo-poo. I began to smile and praise her because this is really the first time she's made that connection. Well, at bath time last night (I'm sure you where this is all going) she was having the best time dancing and squealing and playing in the water. All of a sudden as she was dancing a poot slipped out. She instantly said uh-oh, poo-poo! As I frantically tried to Pull Sarah out of the tub, I noticed it was too late....Ansley has already left a little departing gift. She proudly stood up and said in her best baby voice yelled...POO-POO!!!! 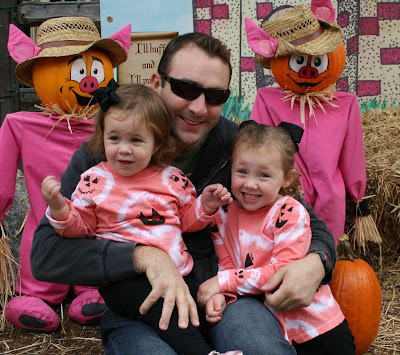 As part of my birthday weekend, Adam and I took the girls to the Pumpkin Festival at Stone Mountain. We walked through the pumpkin patch, talked with Jack Pumpkin and went through his crazy maze, played miniature golf, and saw the SciGuys Science show. 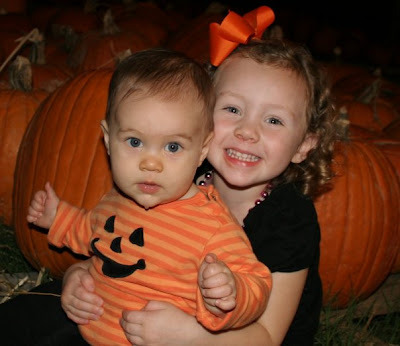 This was Ansley's first memory of being in a pumpkin patch and she had a blast trying to pick the pumpkins up. She tried to sit on a couple of them and tumbled off every time. I wish I had gotten shots because it was hilarious!! I'm sure there will be more opportunities since Sarah's school also has a pumpkin patch this year. Picking out a pumpkin is always exciting for us because it's the kick-off to the holiday season. I hope everyone is enjoying the cooler weather...FALL IS HERE!!! Well, today was the big 37 (or as Sarah says..Three Seven.) I had such a wonderful day. I woke up to Sarah telling me Happy Birthday and how much she loved me. She was so excited, it was like it was her birthday too! I received many wonderful phone calls and emails from all of my friends and family. 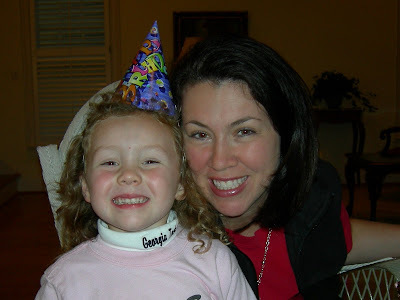 One of the most special was from my best friend Wendy who took the time to sit down and compile a tiny sampling of memories from the past 18 years (www.3peazinapod.blogspot.com). I'm so blessed to have her as my friend...thanks Cornelia, love ya sweetie!! 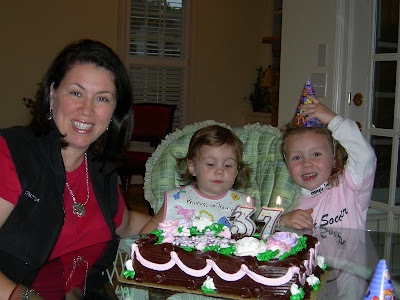 Later in the afternoon we went for pizza at Fellini's and then came home and had birthday cake and ice cream. It was truly a very special day and I hope this next year is the best year ever!! Recently Sarah's been on a "bad guy" kick thanks to the neighborhood watch sign we have in our new neighborhood. Every time we drive past it she yells out from the back seat..."NO BAD GUYS ALOUD MOM!" At first I thought it was cute and creative of her then I came to realize that she is no longer scared in her room or any other part of the house at night because she feels safe knowing bad guys aren't allowed on our street. When I asked her "Where do the bad guys go since they aren't allowed on our street?" And her reply? The bad guy village! Before Sarah left for school this morning, she put her stretchy headband in Ansley's hair (much to my surprise, Ansley actually allowed her to do this.) As the morning went on, I noticed that Ansley still had the headband on. Again, totally shocked because lately she will leave a barette or bow in for about 10 seconds before ripping it out and throwing it to the ground. She doesn't like her hair messed with! All of a sudden, I heard shrieks and screams coming from the girls bedroom. 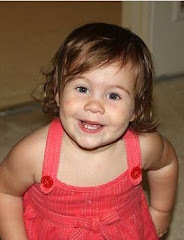 As I ran to check on her I saw her in the floor kicking and screaming with her hands running wildly through her hair. Apparently the headband had slipped out while she was playing and she became very frustrated when she couldn't get it back around her head. When I came over to help her she held the headband out and started saying "hep-hep-hep". I put the headband back in her hair and it was like she won the milk lottery! She began laughing and smiling and gently touching her hair to make sure the headband was back in place. Then she went on about her way playing. It suddenly hit me...my baby is growing up!! Yesterday Aunt Wendy and Gracen sent us a recipe for "Puppy Chow". It sounded so yummy, the girls and I went to the store this afternoon to get the ingredients to make our own. After what seemed like an eternity, we finally finished the recipe (there were plenty of distractions along the way...pan and spoon licking, etc.) The treat turned out very yummy and both girls love their new snack recipe. Ansley actually learned a new word today...MORE! Thanks to Aunt Wen and Gracen for sharing their yummy recipe with us! !